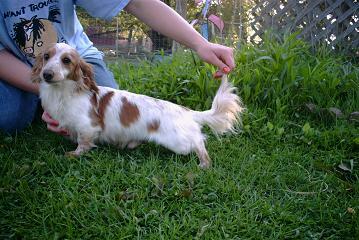 I am very excited about my Cream Dachshund breeding program here at Jodachs. Over the past 6 years I have been working on a beautiful line of Cream Dachshunds that is not only attractive but also has proper dachshund structure and temperament. UPDATE! Check out my "studs" page to see Romie, Jodachs Golden Boy MSC. He is my first show quality smooth cream to be born here at Jodachs and I am especially excited about him. 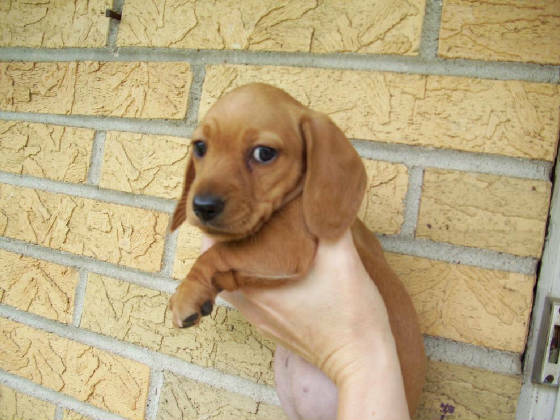 Buying a Cream Dachshund can be very confusing for pet buyers because there are so many breeders advertising Creams under many different names like American Cream, English Cream ect....... below I have explained some of these differences. English Creams- The majority of English Creams have longhair. They are born a dark mousey brown and as they grow (during the first 12wks) they will loose the dark hairs and they will be replaced with cream hairs. In some English creams a blanket of dark hair will stay on thier back, tips of the ears ect... this is called a Shaded English Cream. 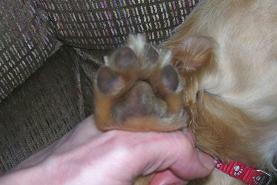 They typically have black nails, wiskers, paw pads, and noses. Clear English Creams- These English Creams are NOT born a dark mousey brown and are not very common. They are born very light and have absolutely no shading on their coat. From birth to adulthood they will have a solid cream coat, light (usually white) nails, white wiskers, pink paw pads, and a light brownish pink nose. These English Creams cannot produce any dark pigment due to a gene they carry known as an ee-red or clear red gene. In the litter shown below the puppy to your left is an English Cream, the three to the right are CLEAR English Creams. Above is an example of a litter of Clear English Creams and English Creams. 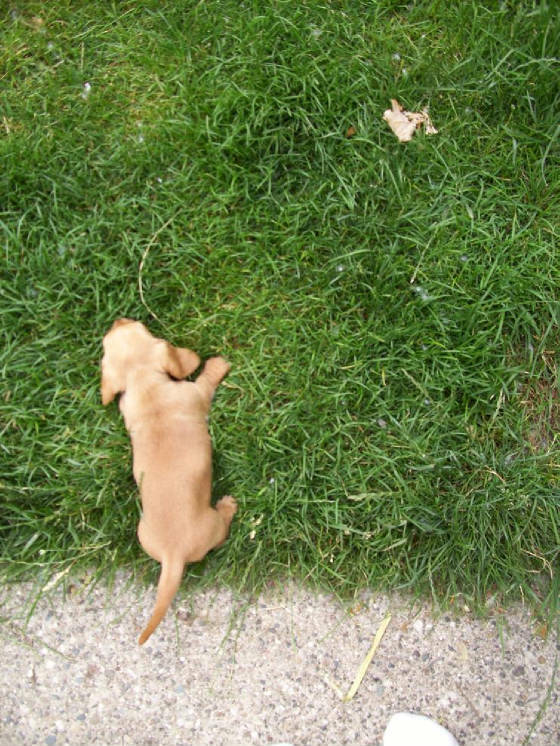 (PICTURED BELOW) Is a Clear Red Dachshund. Many times this is mistaken for a Clear English Cream. When both parents carry the gene for this color BUT ONE PARENT IS RED OR BLACK/TAN breeders need to wait until the puppy is at least 8wks old. Any red tint in the fur means it is a red and not a Clear Cream. As you can see by the pictures this puppy looked cream for quite a while. BLACK & CREAM ENGLISH CREAM- These creams are black with cream points and can be produced by two Solid cream parents or two black/cream parents or a mixture of the two. They have amazing contrast between their dark coats and light creamy points! If a black/cream puppy is born to a Full English Cream parent and an English Cream Carrier parent that is either red, black/tan, or chocolate/tan there is a big chance that the puppy may look black/cream as a puppy but will turn black/tan as an adult. The only way to know for sure is if both parents are Full English Cream. 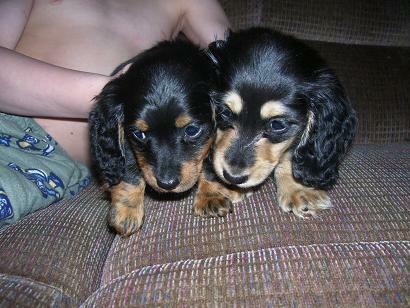 Below, the puppy to the left is a Black/Tan and the right one is a Black/Cream. CHOCOLATE & CREAM ENGLISH CREAMS- These creams have a chocolate body with cream points, they are difficult to find but are very stunning. AMERICAN CREAMS- These puppies are born light and look creamy when they are 12wks old. As they grow older they will become red. The red can very from a strawberry blonde to a dark red. 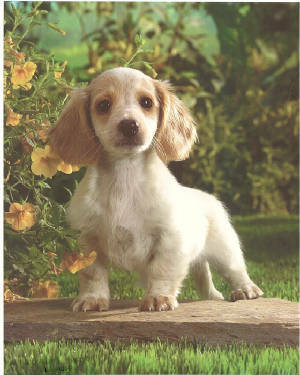 This has confused many pet buyers and breeders into thinking they have English Cream puppies. 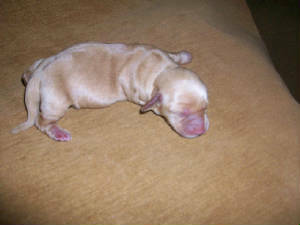 Many pet buyers are disappointed when their beautiful cream puppies turn red as they grow older. Remember, the only way to get English Cream puppies is to have English Creams on BOTH sides of the pedigree. Buyers should INSIST on a written guarantee from the breeder that the cream they buy will not turn red as an adult. 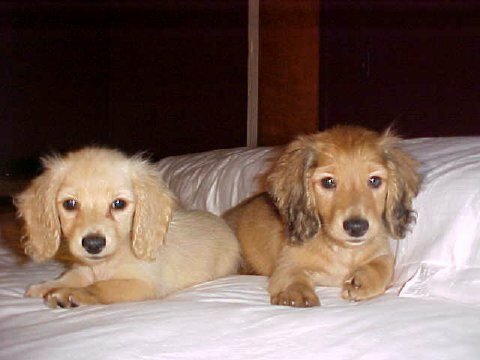 ee-red Dachshunds- These dachshunds are born a light creamy color but it is usually obvious that they are red by the time they are 8 wks old. 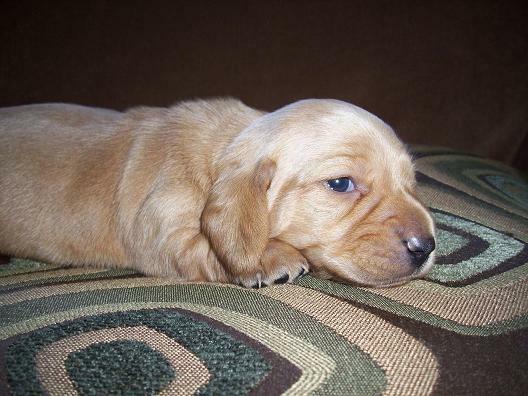 Any red puppies born out of two black/tans or chocolate/tan parents are ee-reds. 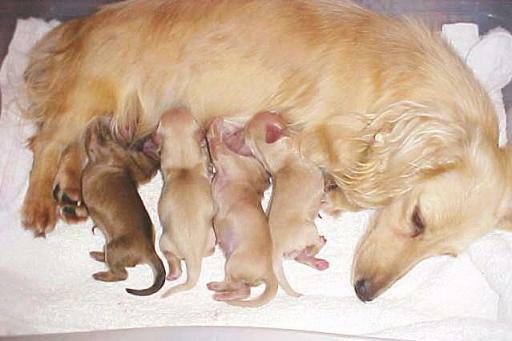 Here at Jodachs I have been working on a line of Smooth (shorthaired) English Cream Dachshunds. I have just started to have these puppies born at my house. I should have smooth English Creams available as pets very soon. If you are interested in a Smooth English Cream please email me to be put on my waiting list. Thank you.